Static Electricity can be a lot of fun to teach and learn about! With just a few simple inexpensive items students can have lots of fun and experience fun hands-on science. So if you are looking for a few fun static electricity activities, you are at the right place! The pictures above are from different blog posts that have static electricity activities. Just click on the links below to go to the posts. Yesterday's post was a collection of fun LIGHT ideas, activities, and experiments that you can use to teach kids about light. If you missed the post, you can click here. For today, I have 2 links. The first will take you to Bill Nye's video on LIGHT. The second link will take you to my website, where I store LOTS of my free worksheets. You will be able to download a free Light Energy Worksheet. Teaching about LIGHT can be a lot of fun! Back in February of 2011, I spent the month posting some fun science ideas, activities, and experiments for teaching about LIGHT. In today's post, I have gathered some of those activities to make it easy for you to access some of the ideas. To read some or all of blog posts just click on the links below. You can also click on the picture to go to a post that is an introduction to Light. There are more activities here on my blog plus I have a Pinterest page all about Light and Color . To visit my Pinterest page, just click on the link below. In yesterday's post, I mentioned a fun book to use to teach kids about GEOGRAPHY. If you missed it, just click HERE to go to yesterday's blog post. Today I have a suggestion for combining Geography and Art. Have the kids design their own compass rose showing the Cardinal Directions (North, East, South, and West). Also for older children, I have a link for a video about latitude and longitude from the website About.com. This video will help the kids learn how to read latitude and longitude lines. After watching the video, students could use a paper plate to make their own grid of latitude and longitude lines including the Equator and Prime Meridian. There are lots more fun geography ideas and resources on my Geography Pinterest Board. Just click on the link below to go to my board. Learning about Maps and Globes can be lots of fun for kids! 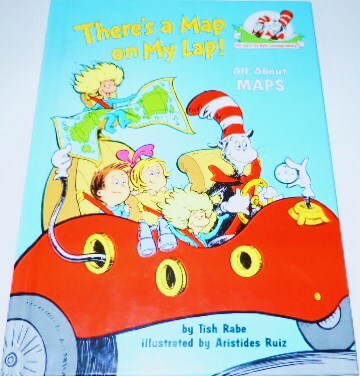 For learning geography your students could use the book titled, There's a Map on My Lap! All about Maps. This series of books is for beginning readers and introduces them to nonfiction in a fun way! Here is a direct link for the YouTube video. I also have a free little worksheet (2 versions) over at my website on cardinal directions (N, E, S. and W.) that you might like to use with the kids. Click on the link to go there and download. Have fun teaching about geography! 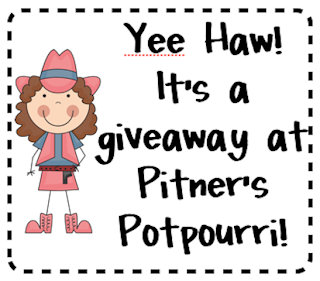 Mary at Pitner's Potpourri is having a wonderful GIVEAWAY at her blog. The list of prizes from TpT sellers goes on and on! Whether you have a full classroom or teach one, two, three, or more children at home, you will find great resources. Mary has 2 giveaways! The 1st is for Grades K-2 resources and the 2nd is for Grades 3 and UP! You can enter both and double your chances of winning! My donation is in the 1st giveaway. It is my Monster Addition Game! To go directly to Mary's giveaway, click on the top picture. To check out Monster Addition, click on the 2nd picture. Good luck, I hope you win lots of wonderful teaching resources! Are you trying to get your homeschool, public school, private school classroom, etc. ready for the kids? Here's a wonderful, free ebook with lots of ideas and products that you can use. This book was put together by Roseanne Mizell and is a collaborative effort from TpT Sellers including myself. 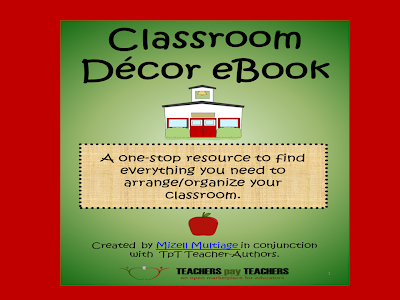 The Classroom Décor eBook includes links to products, freebies, tips, and advice on organizing and arranging a classroom! Here is a link to this free book or just click on the picture above.